To see and hear Myrna and Jerianne in a TV news interview click image above. Jerianne on left. Myrna on right. ALBANY, NY — While traveling the vast highways of New York, among the endless stream of commuters, New Yorkers expect to hear their GPS say: “you have reached your destination”. But for Myrna Bernstein, struggling to find a kidney donor, she found herself a long, long way from her destination. For her, finding a lifesaving donor—let alone getting the attention from even one of those faceless commuters—was nearly impossible. In fact, according to the American Journal of Transplantation, organ donation rates in New York are the 3rd lowest in the country, leaving more than 10,000 men, women, and children on the transplant list alone. Nationwide it doesn’t get any better with 123,000 waiting, leaving 21 souls to die everyday—indicating an obvious discrepancy in the supply of willing donors. Months, and very often, years can go by before people on the Organ Transplant List are called. Once her kidney function fell below 10%, Myrna was placed on that very same list—a seemingly endless one. That, unfortunately, was the easy part. Being placed on a list that long, she may as well have been in the purgatory of transplant surgery—eligible for the procedure, but with no potential kidney in sight. Luckily, most New York commuters have their driver’s license though, which left but a glimmer of hope. This meant the majority of people have at least heard “organ donation” muttered in their local DMV. So Myrna decided to reach out to that elusive NY crowd on their busy commutes, with a plea to extend her life, on a creatively unexpected billboard. This came to her while driving without even knowing whether it could be done or not. “When people see a real person in need of a kidney donor, I think it personalizes it,” she explained. Her ambitions were plain and simple: “I was doing something to save my life.” It wasn’t long before social media picked up on Myrna’s billboard, her only weapon to battle the odds against her. That post, and the “shares” that followed, was all it took for an old friend to land back to her doorstep, Jerianne Green. What set Jerianne apart from other individuals who reached out to Myrna, was the sense of responsibility Jerianne took on once she discovered she was an organ match for her. Electing to voluntarily undergo surgery can be the most daunting part of becoming a living organ donor, but newer technology makes donating a relatively minor procedure. Unfortunately, sometimes it is not the surgery, but the uncertainty surrounding organ donation which prevents people from signing up to be one. A persistent myth, held by much of the population, is that paramedics will not try as hard to save you if you are an organ donor. Of course, saving your life is always considered above all else by any emergency responder. See more about Donor Myths on the right. When asked what she would change surrounding “organ donation taboos”, Myrna said, “We need to get people talking about it. Of course we’re all afraid of talking about death, but it needs to happen [because] unless it has affected you directly, most people do not think about it.” The low rate of donors for the 10,000 person transplant list for NYC alone speaks to the magnitude of this crisis. We all need the courage to have a conversation with our families about organ donation. It may lead to saving someone’s life. Understanding how the process unfolds for a kidney donation or transplant helps alleviate many misconceptions. That’s why expert coaching for the donor and recipient is available such as knowing that accommodations, or transplant suites, are typically within or near the hospital itself where both can stay prior to and following surgery. This avoids some of the in-hospital pressures that often build-up. In this way family and friends have a more friendly environment where they can calmly lend moral support to each patient. For Myrna and Jerianne, it was comforting to know they each had their own dedicated team of specialized doctors for their emotional and medical care—before, during and after. In this way, both donor and recipient can expect the best outcome. Depending on the hospital and insurance, transplant surgery may not impose significant costs on the donor, nor are they required to go through with the surgery even if that decision came on the surgical table. “Knowing I always had the option to back out of the surgery was something that did put my mind at ease, despite also knowing I would not do that, ” Jerianne had mentioned. Immediately after the surgery, Myrna’s exposure to the public was limited being on immunosuppressant drugs. With this issue stabilizing, she is now finding ways to become an advocate for organ donation through the Center for Donation and Transplantation. Their goal is to promote awareness, educate the public, and increase donor registration. Both Jerianne and Myrna have remained in contact and found a higher purpose from their reconnection. “It has given me a peace of mind and a commitment to take care of this kidney because of [Jerianne], considering what she sacrificed.” As for Jerianne, life after surgery has returned to normal and when questioned about whether she would do it all over again? “Absolutely, yes,” was her confident answer. If you need more information about donating or receiving a kidney, please go to the resources area on the right. For more on kidney disease management see American Association for Kidney Patients. These are great resources for all things kidney and transplant related. Many people have misconceptions and fears about donating their kidneys. Here is a list of answers to common concerns that many people have. • The rich and famous do not get preference on donor lists. What matters are your physical characteristics and time on list. • Being in a “coma” is not considered “brain dead”. Only after extensive tests will brain death be declared. If you or someone you know is considering organ donation, or would like more information check out the resources below. 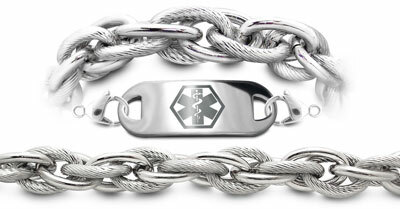 It's important to wear a medical id bracelet if you are a donor or recipient. To get more helpful information click here. Paramedics and doctors need to know that you only have one kidney as a donor. If you're a recipient, they need to know that you're on anti-rejection meds which may affect your emergency treatment. And don't forget to add all medical conditions.